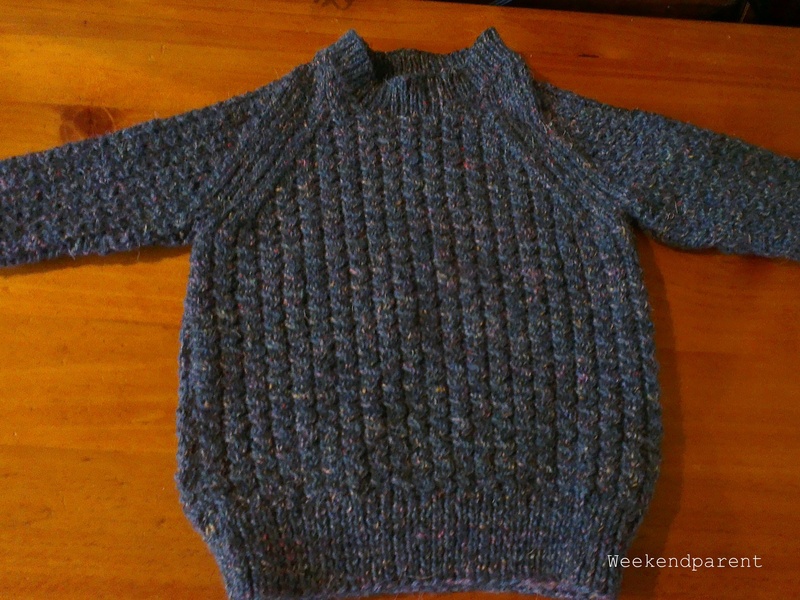 I am a just a wee bit proud of my latest craft project: a 1957 Vogue children’s jumper in mock rib stitch. I haven’t knitted, or done any craft, since DS5 was a baby. Where has the time gone? Inspired by watching my neighbour’s daughter-in-law crochet over Christmas, I decided to take up the knitting needles again. I am finding this can be a frugal hobby, if you use up existing wool you have and/or buy at op shops like I do. If you end up heading to Lincraft and stocking up on the latest yarns it can be more expensive. I find it is a good way to relax – almost meditative, and I if I concentrate enough and get into the rhythm I can actually do some basic Buddhist chants while I knit. But mostly I am just happy I finished this, especially as I got a bit sidetracked with another project. 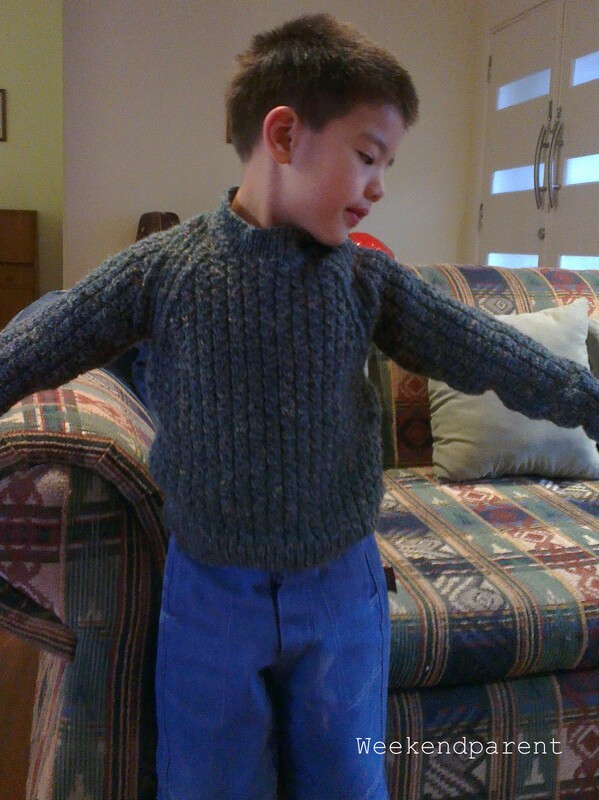 So it took me four months, but now I have a stylish handmade jumper for my handsome son. He has had a bit of a growth spurt since I started, but thankfully it still fits him. And he was happy to unwrap this ‘present’, even if he only wanted to wear it for a short time. 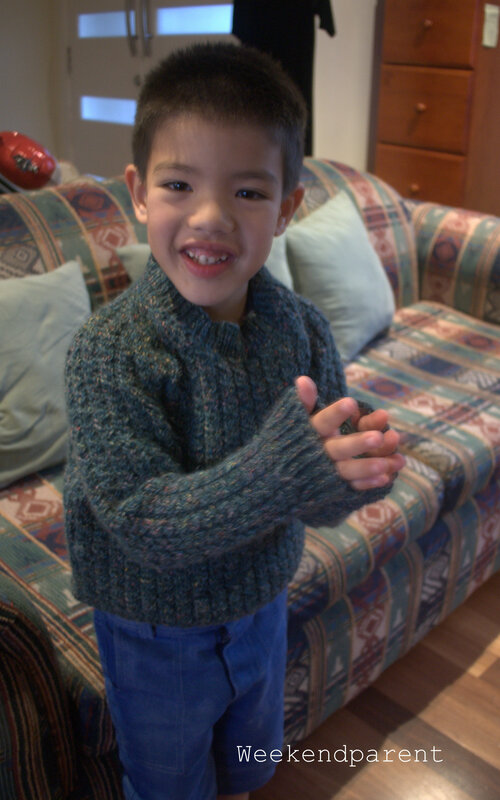 Thankfully the sleeves are long enough, and despite his recent growth spurt, Big A can still fit into this jumper. Now all I have to do is finish a scarf for a present, then make a jumper for Little A. For months he has been giving the cutest look ever and saying “can you make me a jumper tomorrow?” If only it was that quick. That is so good! I starting knitting just before Christmas and managed to make a cardigan (baby size) but it looks no way as good as yours! I’m sure your knitting project is amazing and you are not doing yourself justice. You always see your own faults. Well, at least I know I always do. I love knitting but it takes me forever. My Nan could knit me up anything – jumpers, robes, socks – just by looking at me! She never used patterns and was so quick. I just can’t get my fingers to coordinate. Still, like you said, it is almost meditative. Very relaxing.